Our History The Beginning In 1953 Dr Philip Marshall, organist at The Stump, started a choral singing class in the Green Room at Pilgrim College, Fydell House, when the work studied was Stanford’s ‘The Revenge’. From this nucleus, the Boston Choral Union was formed in 1954, with Dr Marshall as its conductor. Secular works such as ‘King Estemere’ and ‘King Olaf’ by Elgar were performed in school halls, accompanied by the Boston Chamber Orchestra. When Dr Marshall was appointed Director of Music at Lincoln Cathedral, a graduate from Exeter College, Oxford – David Wright, came to take his place. He became the Choral Union’s conductor and so began a long association of choir and conductor. Development The 1960’s were a period of growth and development, combined with a spirit of adventure. The choir began to be challenged – tackling ‘Belshazzar’s Feast’ by Walton and ‘The Dream of Gerontius’ by Elgar. 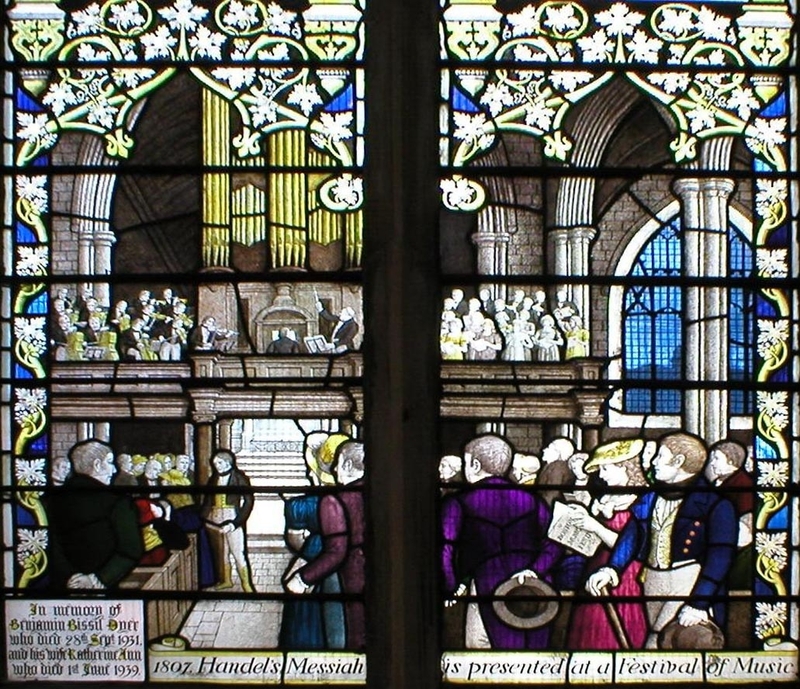 The works needed large numbers of singers and through the student-days friendship between David Wright and Harrison Oxley, organist and choirmaster of St. Edmondsbury Cathedral, these two works were performed by the combined Choral Societies of Boston and Bury St. Edmunds, in each of their towns. This led to liaison with other neighbouring Societies. South Holland Singers, Grantham, and Louth Choral Societies combined with Boston to perform works such as the Verdi ‘Requiem’. The choir joined with other Societies to sing in Lincoln Cathedral , the Albert Hall and Theatre Royal, Nottingham. Works included Beethoven's 9th Symphony, Choruses from Aida, Il Travatore and Cavelleria Rusticana. Boston Choral combined on two occasions to sing with the Wakefield Choral Society, when performances included Carl Orff’s ‘Carmina Burana’ and Bruckner’s ‘Te Deum’. Fundraising When Boston Choral Union started to perform major choral works, larger orchestras and professional soloists were required. Fund raising events were needed to offset any deficit that resulted. They still continue to be a necessary part of the society’s programme. Events have ranged from Blanket Washing, Christmas and other Cake Baking, Jumble Sales, Coffee Mornings, Market stalls and Raffles. Gilbert & Sullivan Light Operas were performed including ‘Trial by Jury’ and ‘Patience’. As David Wright enjoyed performing in them, Brian Thurlow - music master at the then Kitwood Boys School, was the Musical Director, with the Society’s secretary Rex Self, as Stage Director. After ‘The Mikado’ it was felt that the work was too much for one committee. It was at this point that the Boston Choral Society and Boston Operatic Society were created under the umbrella of Boston Choral Union. For several years there continued to be joint members but over subsequent years the two Societies became independent. During the 1980’s the Society included Gilbert & Sullivan again in its programme, staging ‘in-the-round’ performances in the Sam Newsome Centre, led by David Wright and produced by Jean Green. These popular fundraisers included ‘HMS Pinafore’ Ruddigore’ ‘The Gondoliers’ ‘Yeomen of the Guard’ ‘Trial by Jury’ and ‘The Gipsy Baron’ by Strauss. New Music The successful concerts provided the opportunity for the Choral Society to commission a new work. The poem ‘High Tide On The Coast of Lincolnshire’ by Jean Ingelow, a Boston born Victorian poet, was chosen as the text. Local composer Mr Colin Hand, accepted the challenge. A sensitive, dramatic piece for choir and organ was successfully performed in both St. Botolph’s Church and Lincoln Cathedral. After David Wright retired from the Society, a member Robin Carter became the ‘caretaker’ conductor. During the 1990’s Kenneth Lank became the conductor and gradually morale and membership lifted. Popular works such as the Requiems of Fauré and Mozart with additional pieces by John Rutter, were included in the repertoire. The Society commissioned another new work ‘Let Earth In Concert Sing’ by Llewllyn. The work proved popular with choir and audience, with its beautiful harmonies and an arrangement of the old Sankey & Moody hymn ‘Shall we Gather At The River’. 50 Years on and Still Going Strong! The choir continues to flourish in the 21st century. Performances have included Handel’s ‘Messiah’ Mozart and Fauré ‘Requiems’ Haydn’s ‘The Creation’, Stanford - 'The Bluebird' - 'Heraclitus' and 'The Revenge' Gorecki 'Totus Tuus' Dvorak - 'Mass in D'. Extracts from Bach's Christmas Oratorio. Our 50th Anniversary concert was a performance of the 'Dream of Gerontius' - in Boston Stump. Twinning Link In 2002, the Choral Society formed a link with our twin town of Laval - France. The French choir La Lyre Saint Tugal made a summer visit to Boston for a performance of the Verdi Requiem. 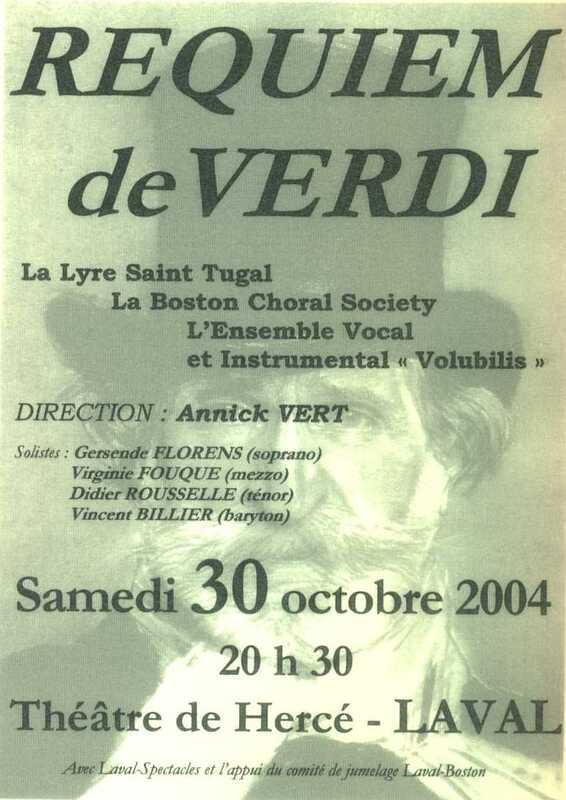 In the Autumn of 2004, members of the Boston Choral Society and friends travelled to Laval for a repeat performance of the Verdi Requiem. 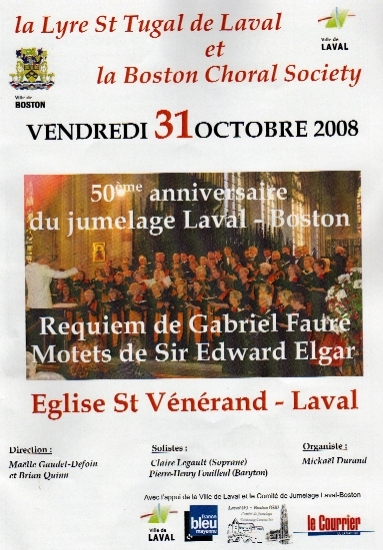 In May 2008, members of La Lyre Saint Tugal returned to Boston for another major concert in Boston Stump. Works included three Elgar Latin Motets, Lux Aeterna and Land of Hope and Glory - in addition to Faurés Cantique de Jean Racine and Requiem. In October 2008, members of BCS made their first return visit to Laval. Premiere On 26th September 2009, the choir performed a new work - The Boston Gloria (composed by our then Musical Director Brian Quinn) in 'The Stump' - to celebrate the 700th Anniversary of St Botolph's Church.